Pumpkins for Pets will be Saturday from noon to 4 p.m. at AC Starr Farms at the corner of Starr Road and Wellesley Avenue. Proceeds will benefit Partners for Pets in Spokane Valley and River City Pet Rescue in Post Falls. The produce stand will be open through the end of October, Tuesday through Friday from 9 a.m. to 6 p.m., and Saturday and Sunday from 9 a.m. to 5 p.m., or until dusk later in the month. They accept cash or checks. It started five years ago as a good way to sell a lot of pumpkins. 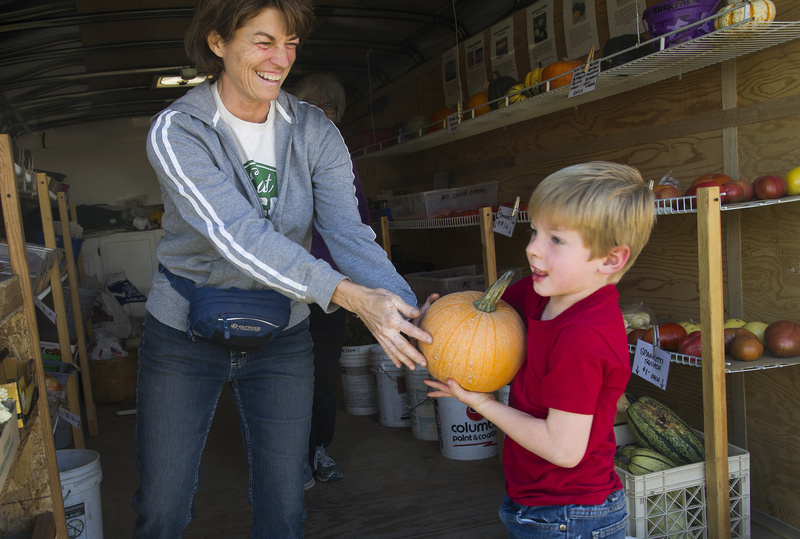 Robin and Eldon Jons of AC Starr Farms, 4603 N. Starr Road, decided to throw a harvest festival. Robin Jons said the couple don’t have kids, but they have pets, all of them rescue animals. The first cat they brought home, Junior, who died last year, was found at Partners for Pets, so they decided to make the the festival a fundraiser for that organization and added River City Pet Rescue in Post Falls, because many of their customers come from Idaho. Jons said she knew the two organizations are small and rely on private donations. That first year, the couple raised $250. Last year, they raised more than $1,000. “It’s definitely evolved from there,” she said. Pumpkins for Pets promises fun for the whole family, including the four-legged members. There are hayrides on old tractors, which Eldon Jons collects, a corn maze, face painting, food vendors and music. A trebuchet will launch expired produce. Pets are invited, and Jons said many dogs come dressed in their Halloween finest. For every pumpkin sold, the Jonses will donate $2 to pet rescue organizations. She said part of their success in growing their festival is connecting with local businesses. There will be raffle drawings every hour with gift certificates to the Otis Grill, local veterinarians and River City Pizza. Safeway in Liberty Lake donated the soda pop. “We try to get that local, symbiotic relationship going,” she said. The corn maze is a community effort as well. Members of Central Valley High School’s Key Club will help Eldon Jons cut and haul corn as part of their community service hours. Every person working at the festival is a volunteer – the Jonses don’t have any employees at the farm. AC Starr Farms started as a hobby farm. The Jonses have lived on the property for about 8 years and began farming it about 5 years ago. Robin Jons said everything they sell is planted by hand and grown on their farm. “Our whole thing is about being fresh,” she said. Customers often ask her where some of her produce comes from and she said she can proudly point to the exact spot where she picked it, usually that morning. They have made a name for themselves with their bi-color corn, a variety Jons said is top secret, and will not share with anyone. They are also known for their green beans by the bucket and candy onions, many of which weigh between two and three pounds each. “They are sweet, like candy,” she said. They don’t use herbicides or pesticides and weed everything by hand. The farm relies on volunteers and the generosity of their customers, many of whom drop off plastic grocery bags they want to recycle and the Jonses use them for the produce they sell. “We just have really great customers,” she said.